It’s finally here. 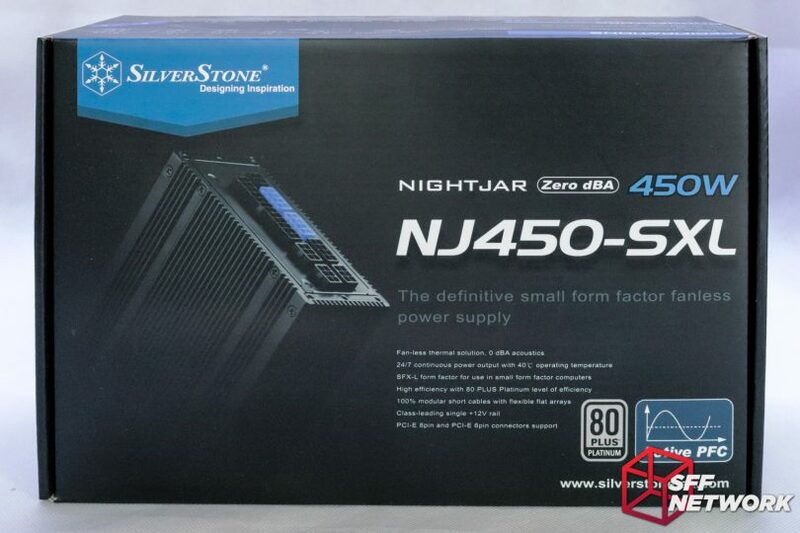 SilverStone’s Nightjar NJ450-SXL, the completely passive 450 Watt SFX-L power supply has arrived. 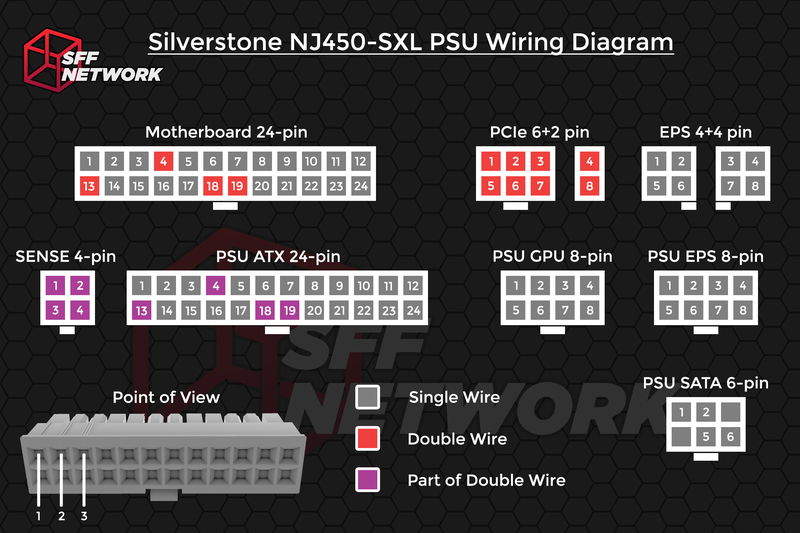 SilverStone gave SFF Network the first look (and I mean first!) at this unit at Computex 2017, and our community has waited with bated breath since then. The idea of a passive (or even just a silent) SFX power supply has been on our minds for some time. Somewhat satiated by semi-fanless designs, we nonestheless still desired that final step – completely fanless. 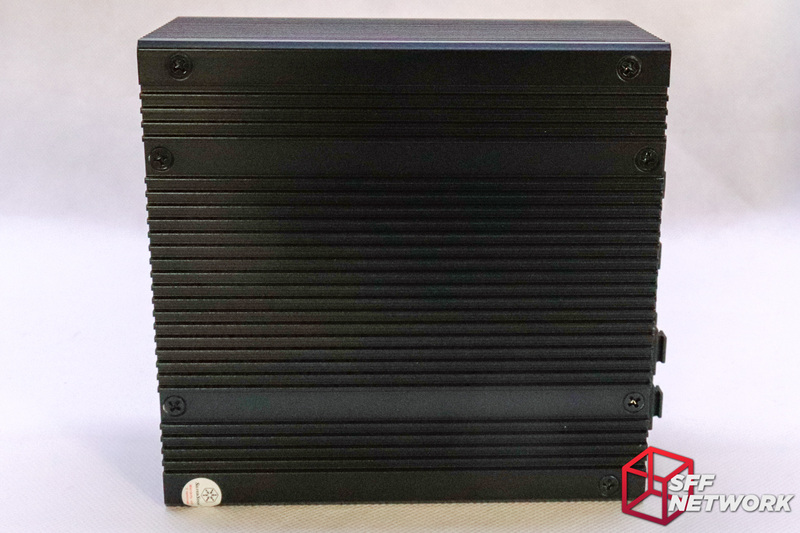 In all honesty, I expected the first real foray into fanless SFX(-L) would have been a 300W unit at best, but SilverStone has jumped straight to 450 watts – a perfectly adequate capacity for most of the more powerful SFF systems at present. Let’s see how the first contender in this new market segment sets the bar! The SilverStone Nightjar NJ450-SXL is available for around US$190 on Amazon.com at time of writing. The Nightjar series caries with it a more subdued aesthetic than their mainline counterparts. 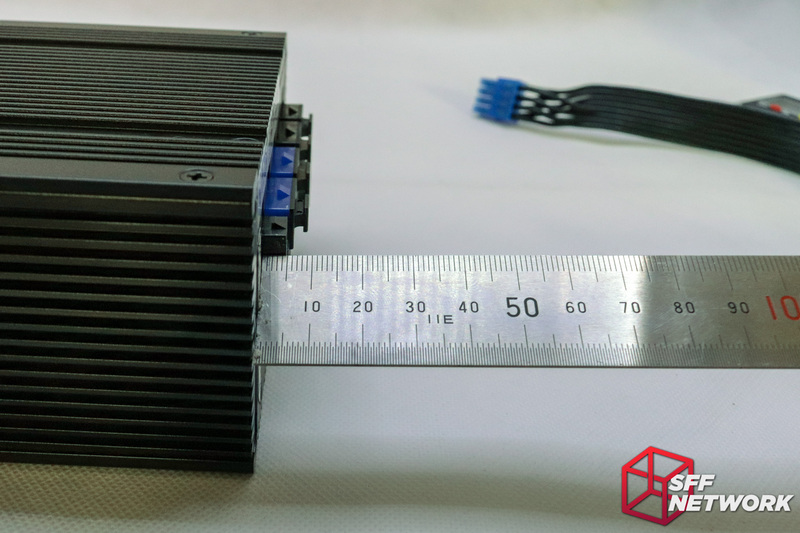 SilverStone claims that this is the definitive small form factor fanless power supply. 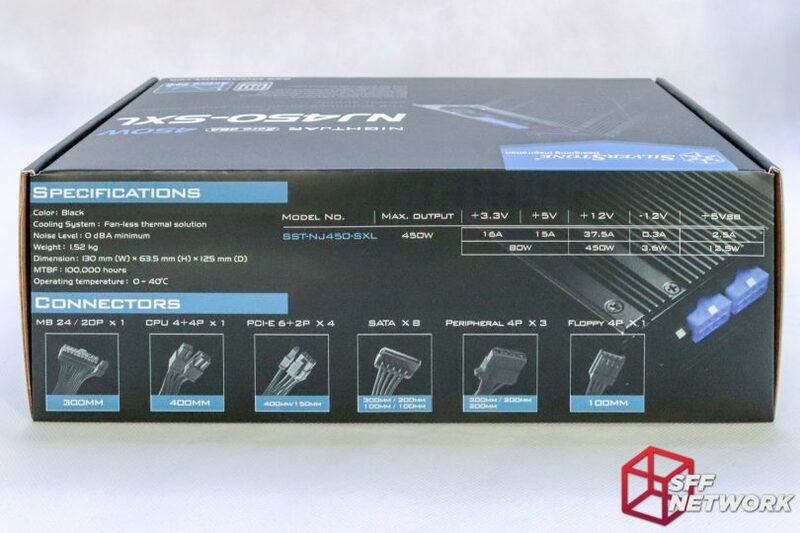 Well, apart from the lack of competition to validate such a claim, we shall see if this PSU lives up to that hype. Remember, click to embiggen! On the rear is a multilanguage section explaining the basic premise and features. Specs, reproduced above, and we’ll have a closer look at the cables later on. 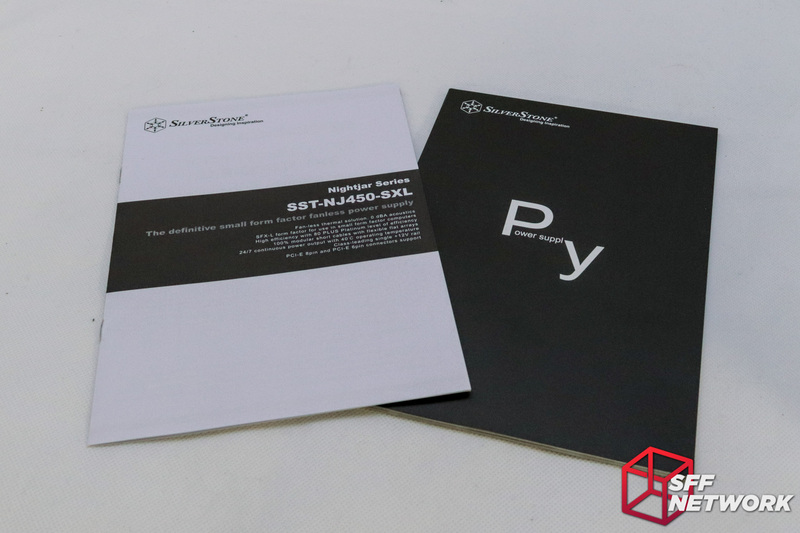 Opening the box, we are greeted by two items of documentation – a spec guide, as well as a user manual. 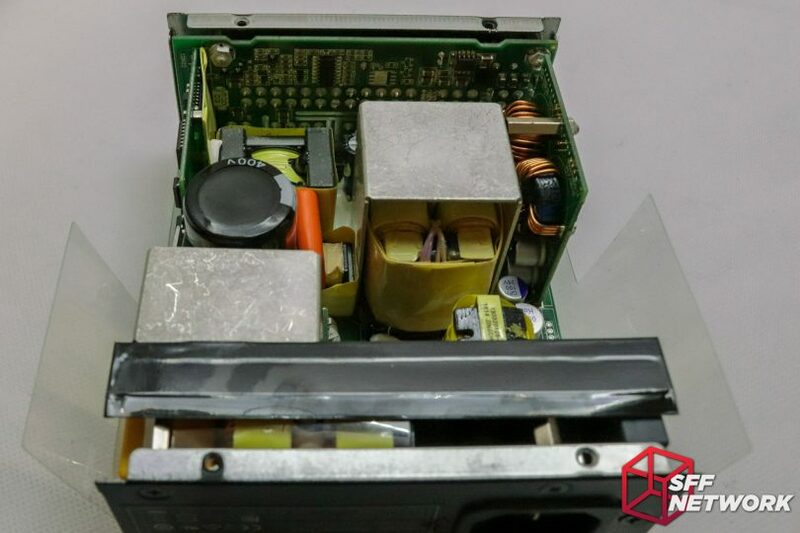 Removing these shows us an eye for detail that has continued from the regular SFX and SFX-L power supplies from SilverStone. 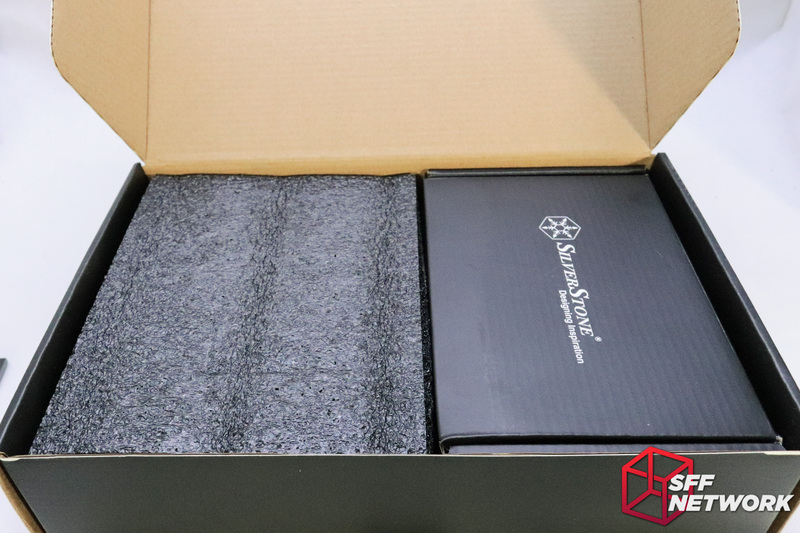 Everything is well protected for shipping, and the various cables and accessories have a storage box for long term keeping – only the most extreme of SFF systems will need all of these cables. 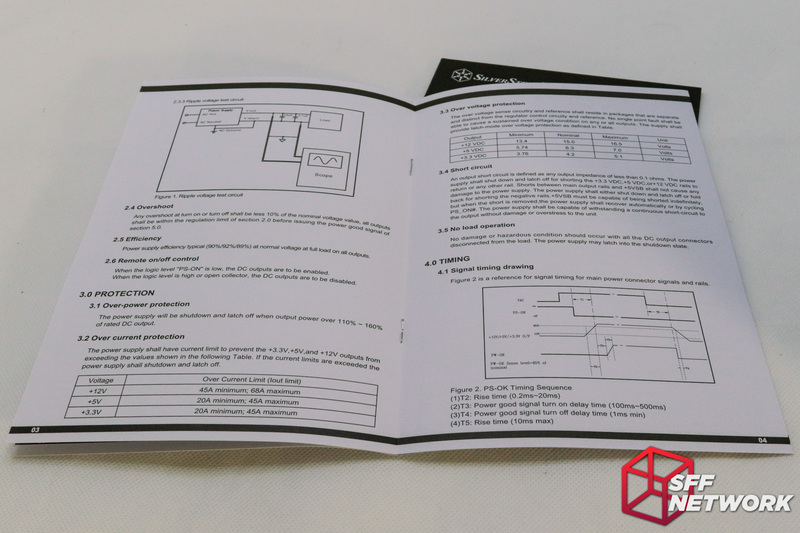 The specification document included with the power supply is insanely detailed for a consumer product. Including diagrams and descriptions of how various functions… function, and how they are tested. Attention to detail. Bonus points! 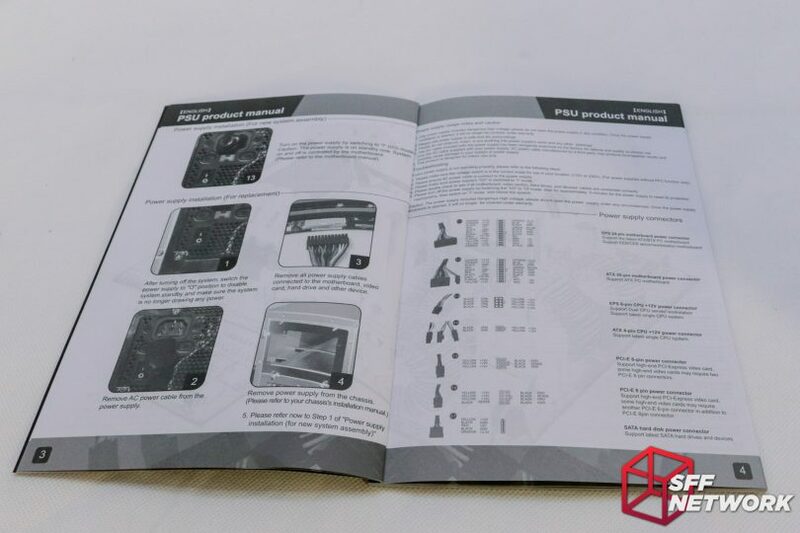 The second manual is a multi-language guide to installation. Which includes a wiring pinout. More bonus points. 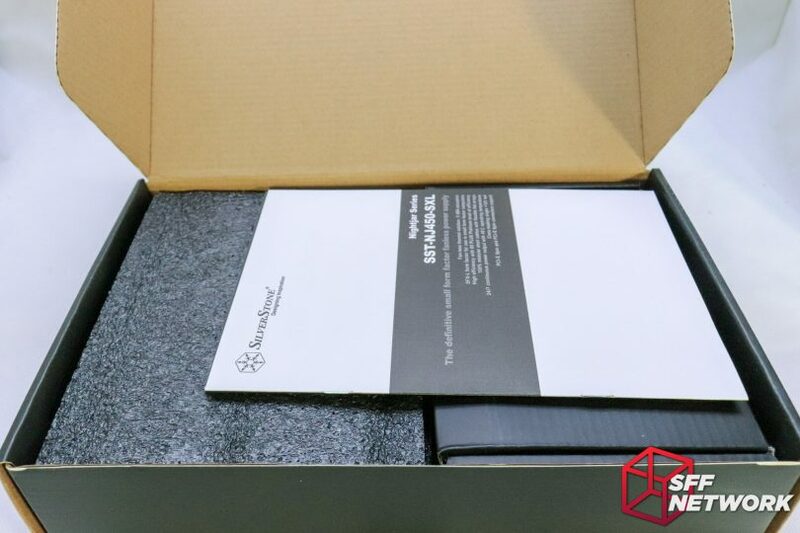 The cable set comes in it’s own box. Not quite the fabric bags of the old days (Corsair HX620 for example), this is still a suitable way of keeping unused cables. Yes, a New Zealand power cable was included in this review sample’s loadout. The details matter – I’m used to receiving USA or UK plugs with review units – I can’t use those here without some janky adapter! 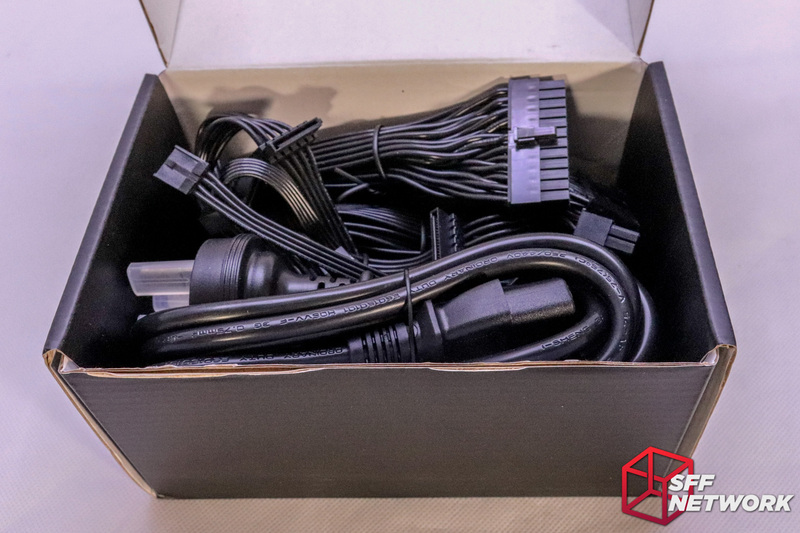 The included power cable is fully compliant with AU/NZ standards (unlike a bunch of aftermarket power leads sold on AliExpress, Ebay or even Trademe), so thumbs up here. The wire reports in at 0.75mm², or approx 18.5 AWG. More than ample enough for the expected max input of just over 2 Amps on our tasty, efficiency gaining, 230V mains supply. 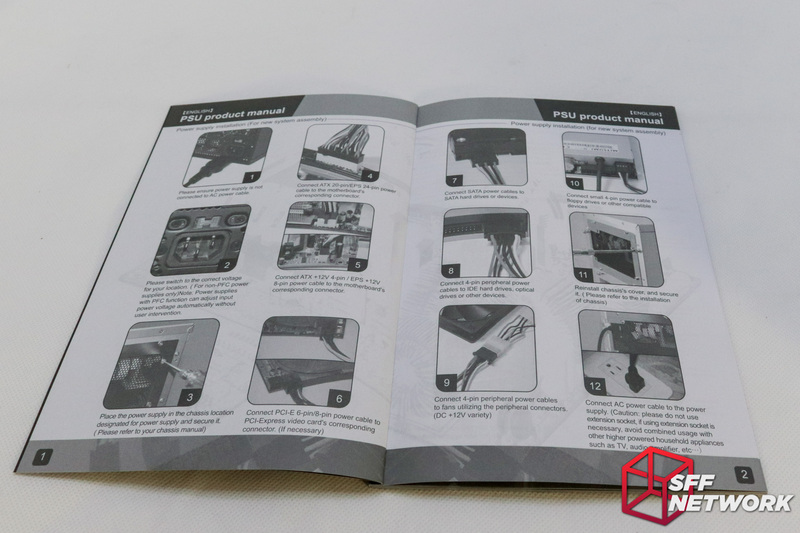 Note that your local regulations may differ – whilst the cables included with good brand power supplies are generally trustworthy, it pays to buy quality if buying power leads aftermarket. 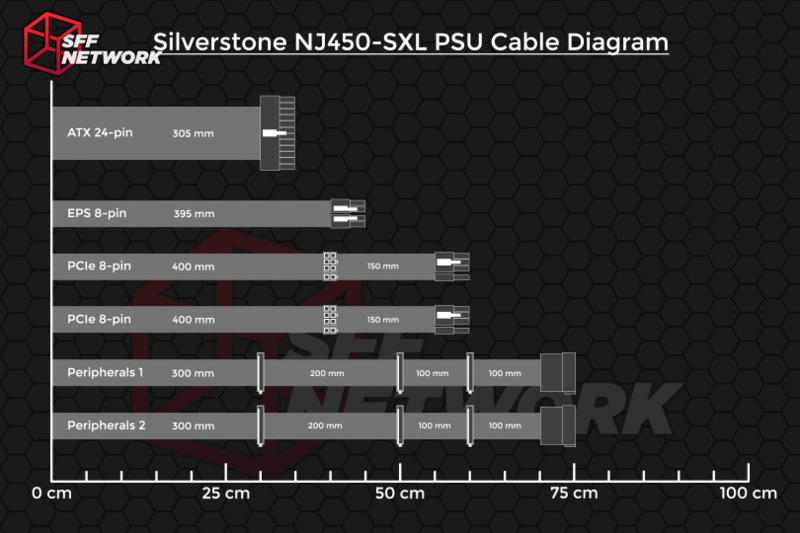 Some cable manufacturers have been known to lie as to the actual wire thickness included in a cable – upon testing (measuring resistance over the cable and comparing to known copper resistance over the same distance), I can confirm SilverStone’s cable manufacturer provides the correct wire thickness! Excellent. The cables included with the NJ450-SXL are of the flat ribbon type, a solid compromise between pre-bundled cables and loose wires. The flat ribbons can also be separated as needed to aid in cable management. The wiring used in the ATX 24 pin (excluding the sense wires, which are 22AWG), GPU and CPU power cables are a hefty 16AWG. Stepping down a step to 18AWG are the peripheral cables (SATA and Molex). The Molex to floppy adapter sits in at 22AWG, but this is an adapter that 99% of users won’t use. Not sure why SilverStone still includes such an adapter! The sticker is on the input side of the power supply, due to all four sides of the power supply being extruded heatsink – rather challenging placing a sticker on these surfaces reliably. 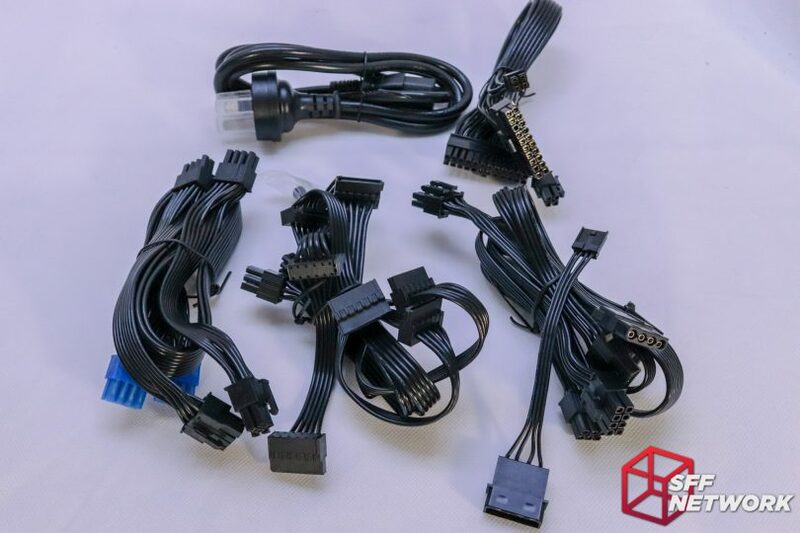 A new plug layout compared to the other SFX(-L) power supplies offered by SilverStone, however each cable is pinned the same as the rest of the range. Also notable is the sheer quantity of stickers! 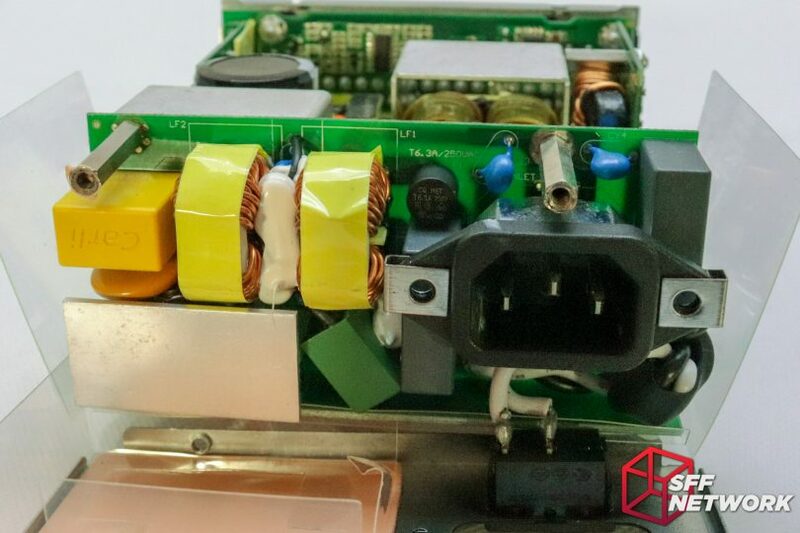 These would normally be placed on the sides of a typical power supply, however, that is not possible on this PSU, as mentioned above. Interestingly, the side panels of the chassis are threaded on both ends – which could lead to some interesting mounting methods! 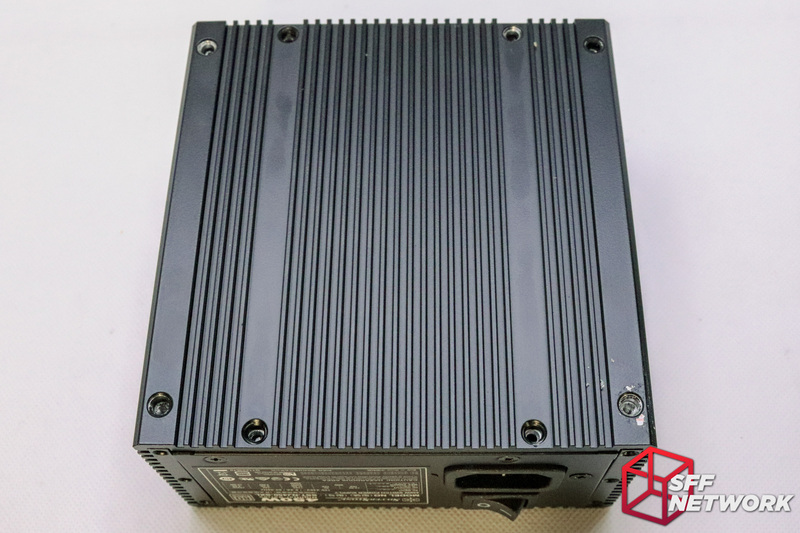 Inverse PSU in an NCase M1 for cable management, maybe? The base (or top!) also consists of an extruded aluminium panel. The powdercoating is of a high quality, and seems resistant to scratches. The modular sockets themselves stick out 4mm or so – meaning that in some chassis you may end up with a tight squeeze on the plugs. Including the plug, this becomes 16mm, plus a couple of mm for cables to bend out of the way. 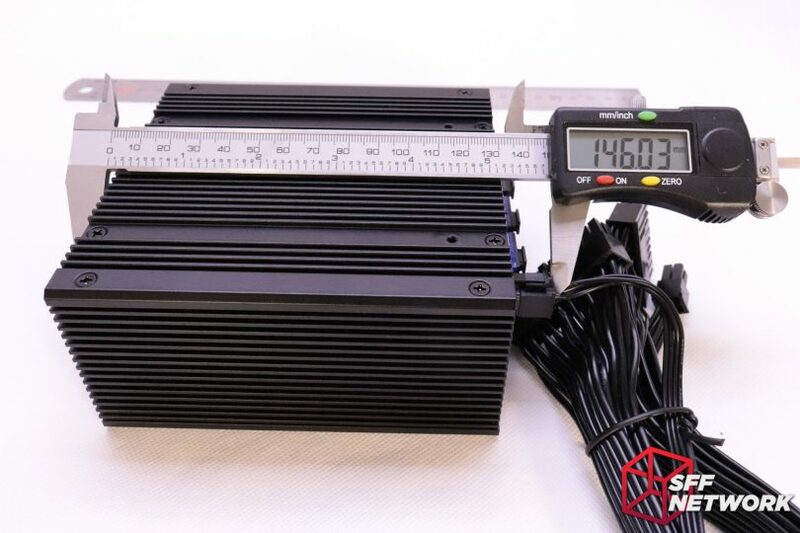 From the back of the power supply, to the end of the modular plugs, we have 146mm – the true length of this power supply in service. 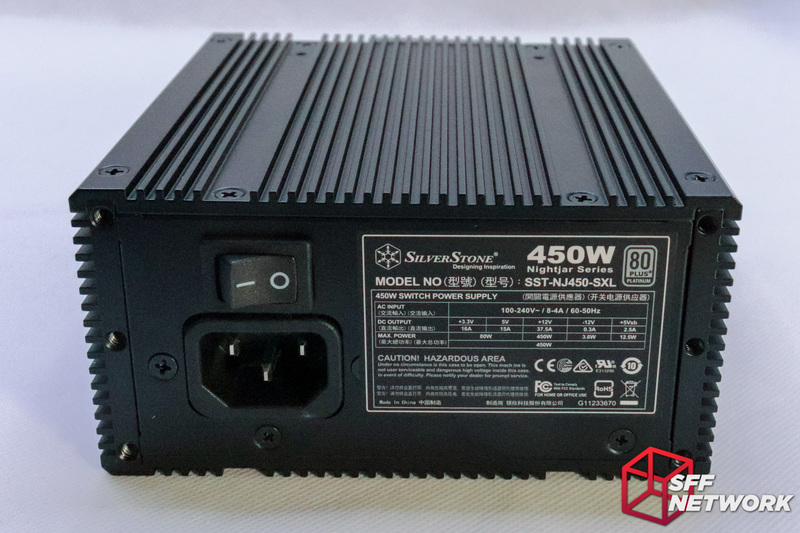 Not quite the 130mm quoted by SilverStone – an oft overlooked dimensional inconsistency by power supply manufacturers, one we find to be particularly frustrating. 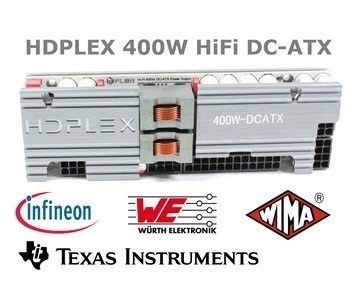 Budget around 150-160 mm for this particular power supply to fit, including some cable room. 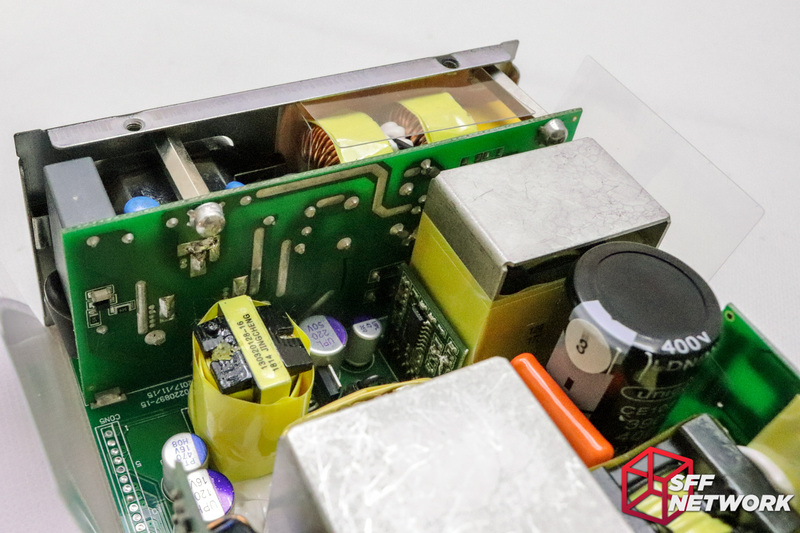 The testing of this power supply is simpler, yet more complex, than a traditional PSU. We don’t have any fan profiles to test, no noise measurements, just outright performance in power and ability to keep itself cool (enough). All up, this beast weighs in at a theoretical 405 watts, nearing the maximum sustainable power output of this PSU. Let’s get to the actual testing. We let the system idle in a temperature controlled room (sitting at 17 degrees celcius) for half an hour, and measured the shell temperature versus ambient. With this, in an open air environment, a delta of 3 degrees was returned – not bad! Load testing time, and woops! Too much of an overclock, it peaked high enough to trigger overcurrent protection. Great to see this works! I’ll tone down the OC a little, and try again. 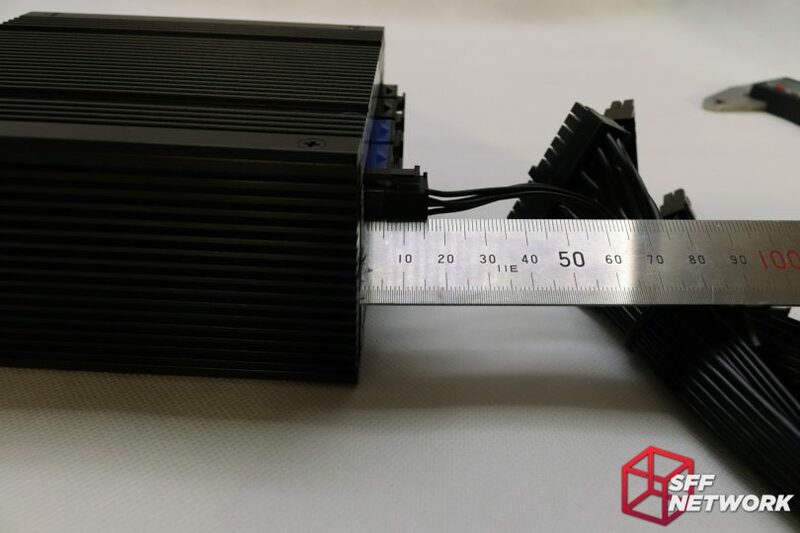 The problem with measuring power at the wall is that most ammeters don’t catch spikes in power – just ask Radeon Nano owners! So, whilst the system sits at around 410 watts at the wall (measured with a low quality clamp ammeter), the peaks sent the PSU overcurrent. Under a more moderate load (I left the CPU at 3.7GHz), the system remained stable under a load of FurMark and Prime95 Blend. This is an absolutely brutal workload for any system, let alone one with a passively cooled power supply. Loading the system for half an hour in an open air environment again, we ended up with a temperature rise of 12 celcius over ambient. For a more realistic test, I then restricted the passive airflow, more akin to it being inside a SFF chassis. No fans were added, this is really a torture test. Another half an hour passes, and the Nightjar NJ450-SXL rocks in with a total temperature rise of 18 degrees over room ambient. Finally, I cranked the heat up, literally, as warm as I could go, to a room ambient of around 25C, and then aimed a hot air gun at the power supply. Over temp protection kicked in after a short while, excellent. After letting the unit cool down some, the system could be booted as if nothing happened! Removing the 8 countersunk M3 screws from the top panel lets us into this silent power supply. Oh, and the destruction of a warranty void if removed sticker. Sorry… not sorry. Well, this is different. 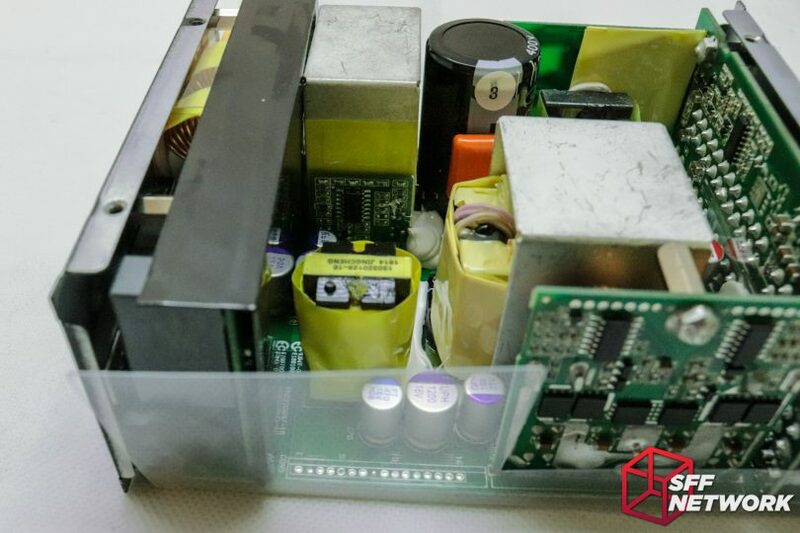 A marked departure from architectures of old, the layout of this PSU is focused on cooling the components via the side panels – and it shows. Lets’ look at the panels. 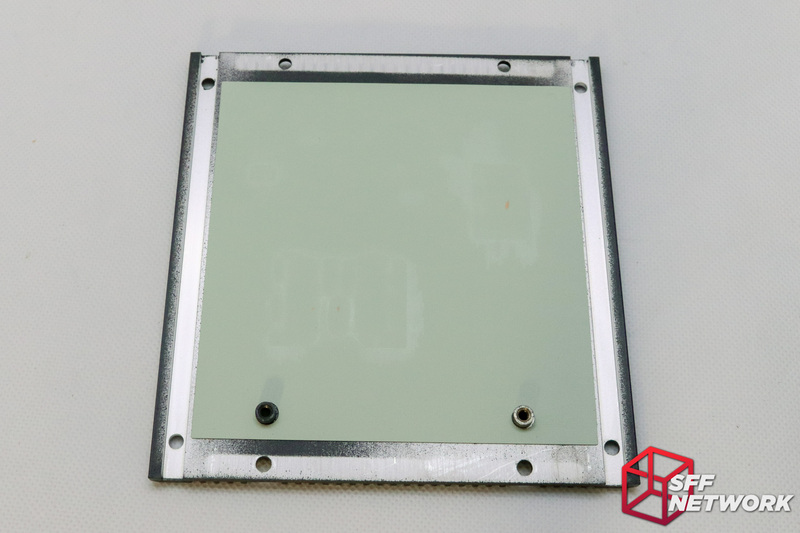 The top panel has three, 4mm thick, thermal pads attached to a larger thin thermal pad. 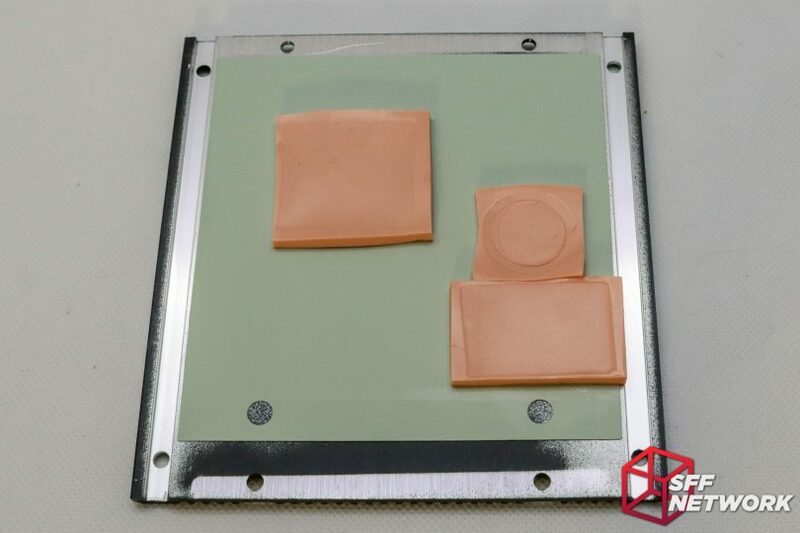 These pads cool the transformers, as well as the capacitor. Cooling further components, are the side panels, with more thermal pads (also 4mm thick). The chassis appears to be assembled, painted, and then the power supply circuitry added – the aluminium is powdercoated in black. The base also has a huge thermal pad! The two standoffs are where the PSU PCB mount to the panel. The aforementioned thin thermal pad contacts the thicker one here, sucking heat away from the main PCB. 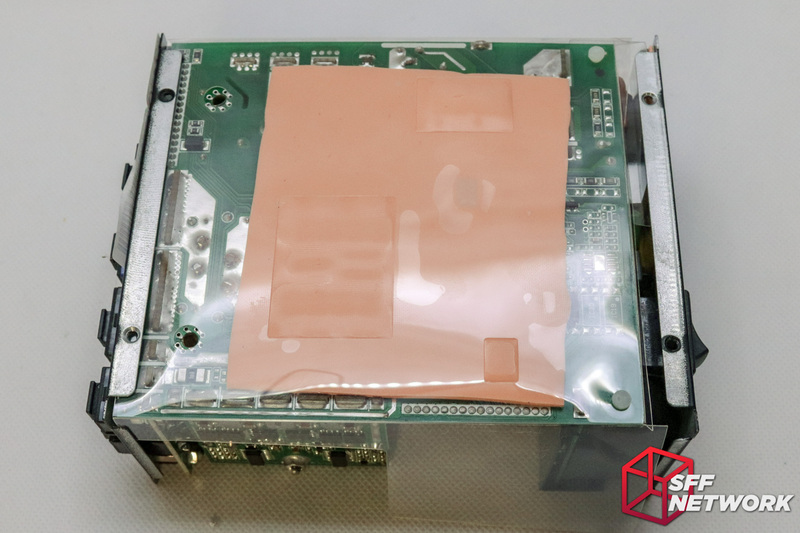 Whilst the plastic sheet is insulation as to electricity, some heat transfers through – and some is better than none in such a product! To the components. 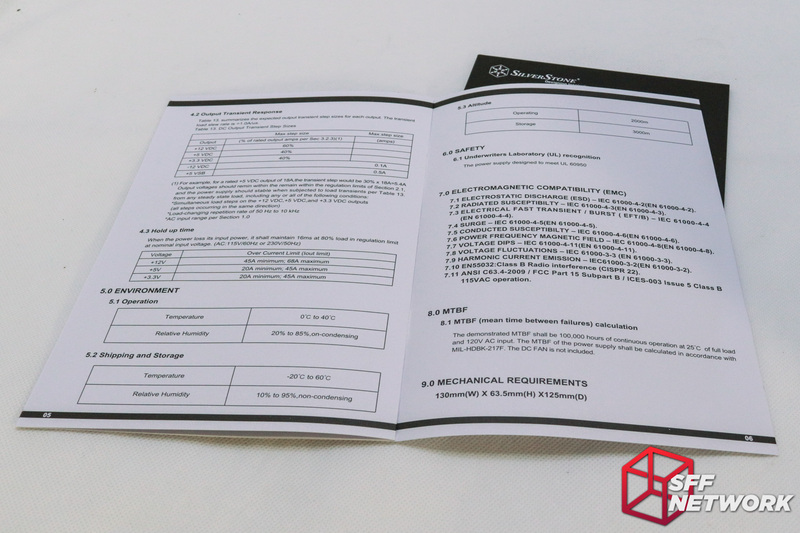 Datasheets inbound! 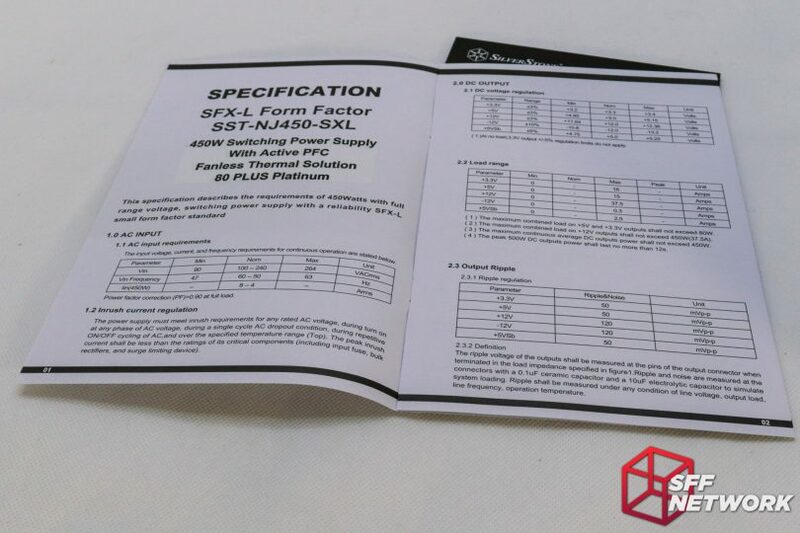 Click each part number for a link to a PDF datasheet for that component. 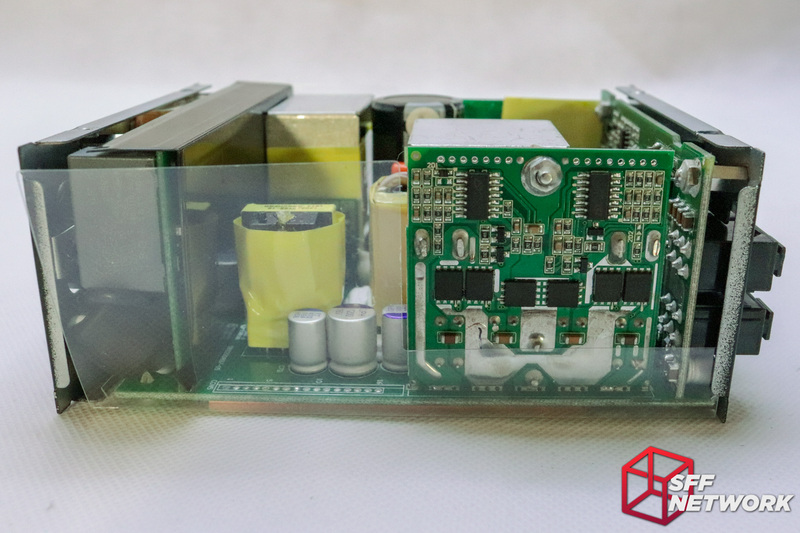 To one side, we see a pair of 5R140P power transistors, controlled by a SI5230BD dual isolated driver chip. 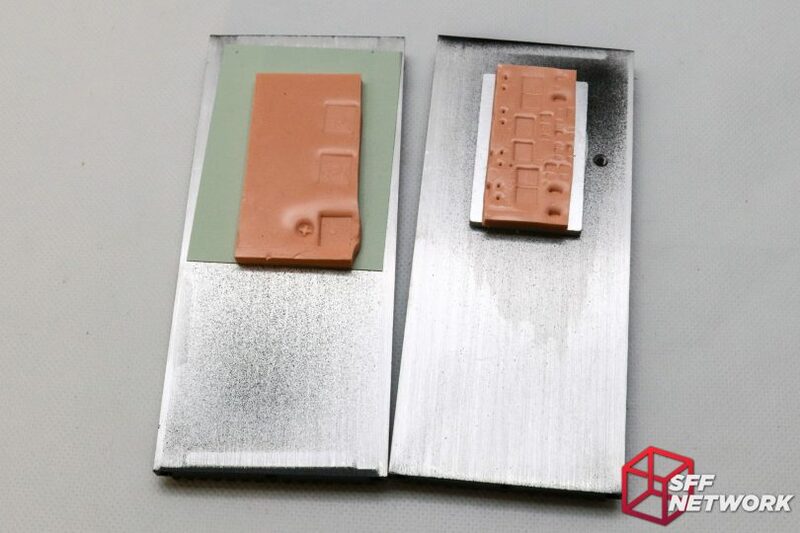 The dual pin package with ferrite beads to the right of this PCB is a Cree C3D08060A Silicon Carbide Schottky Diode. On the other side of the PSU, we have another soldered in daughterboard. This aesthetically pleasing board is home to a pair of APW7160A single channel synchronous buck PWM controller, controlling 4 (the portrait orientated chips) BSC018NE2LS Infineon OptiMOS power MOSFETs and 2 (landscape) BSC050N03LS OptiMOS MOSFETs. Hiding in the middle is an AT6101L, a chip controlling the Active PFC subsection. 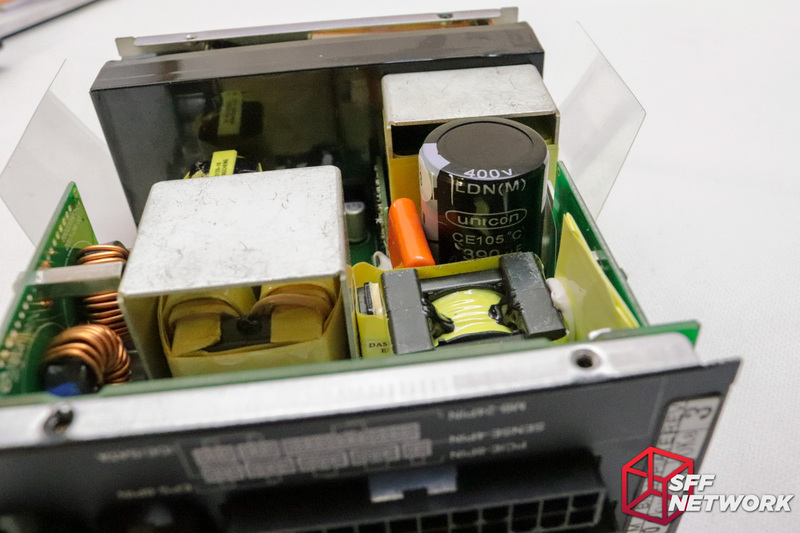 Unicon LDN series – a Japanese designed and made capacitor. Nuzzling up against the main cap is a MPX JJ0 film capacitor, designed to suppress noise in the circuitry. An interesting aside, note the metal shields on the transformers – these appear to be there to transfer any heat from the transformer to the top panel. Removing the black plastic shield between the input section and the main PSU area reveals.. not much. Hmmm, can’t see into the AC input area. Screwdriver time. From the right (because the AC input is on the right!) – a pair of HJC MKP-X2 2 uF x2 interference suppression capacitors surround the plug. The little black capacitor looking item is actually a 6.3A slow blow fuse! 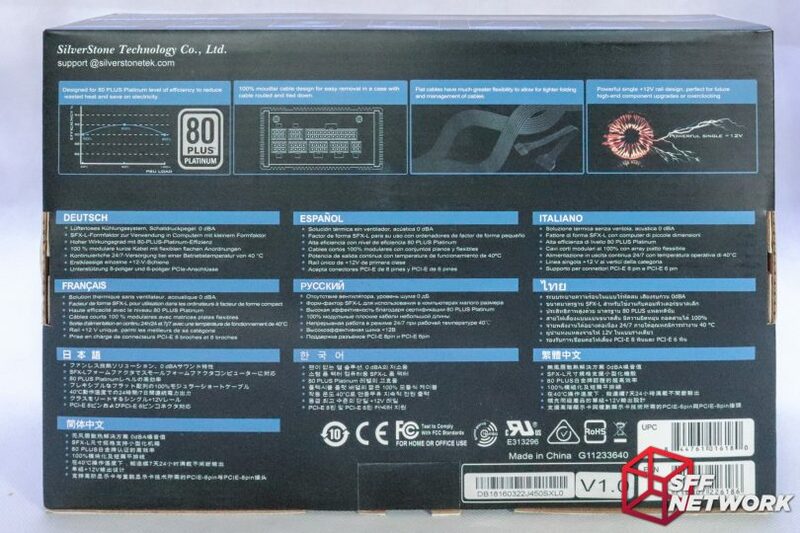 The blue capacitors are safety rated X1/Y2 units, namely AC222M models. 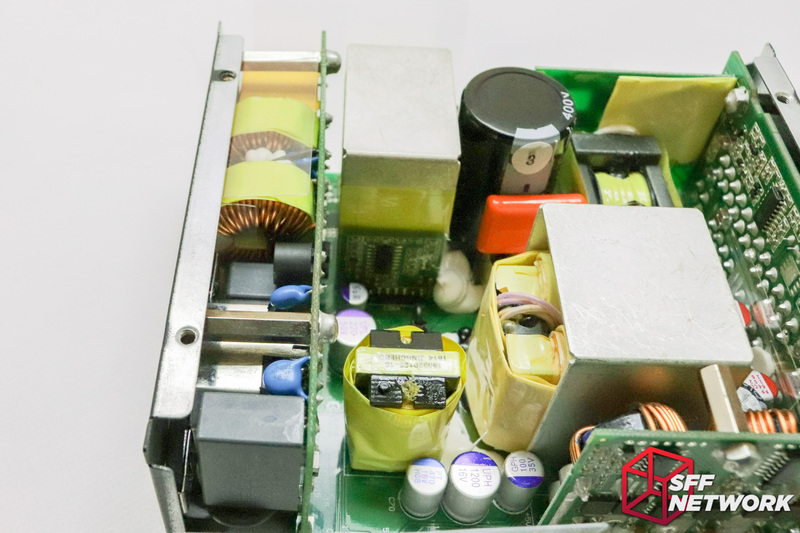 Moving left, we have a couple of inductors, above a green box – another film capacitor, this time a Cheng Tung X1 CTX 0.47uF X1 class cap. The Carli capacitor in yellow is a class Y capacitor, a member of the MPX series. A bridge rectifier setup hides underneath the sole heatsink here, but I am unable to see any markings without destructive methods! 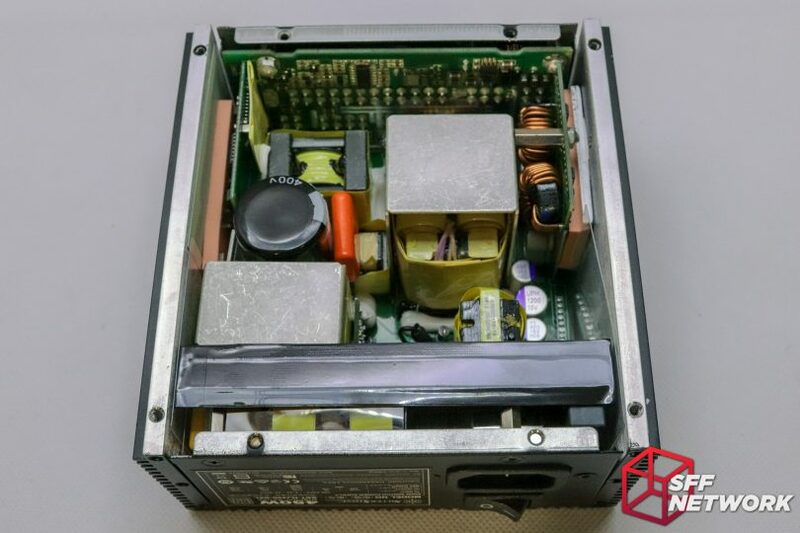 All the soldering in this power supply is top notch, as are the component choices – critical stuff for something with no active cooling! As we’ve discovered, the layout is unique, but for valid reason. 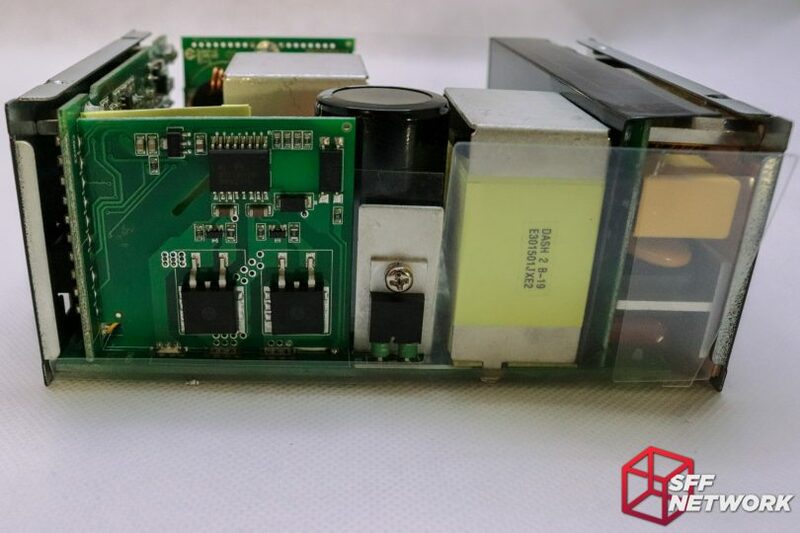 The heat generating components – MOSFETs, transistors and the like, have to be located in such a way that they can be directly heatsinked by the panels of the PSU chassis. It’s always difficult to judge a bleeding edge product on its value when we have nothing else in the market segment to compare it with. What is possible, though, is judging the product on particular aspects – performance, ingenuity, advantages and disadvantages. 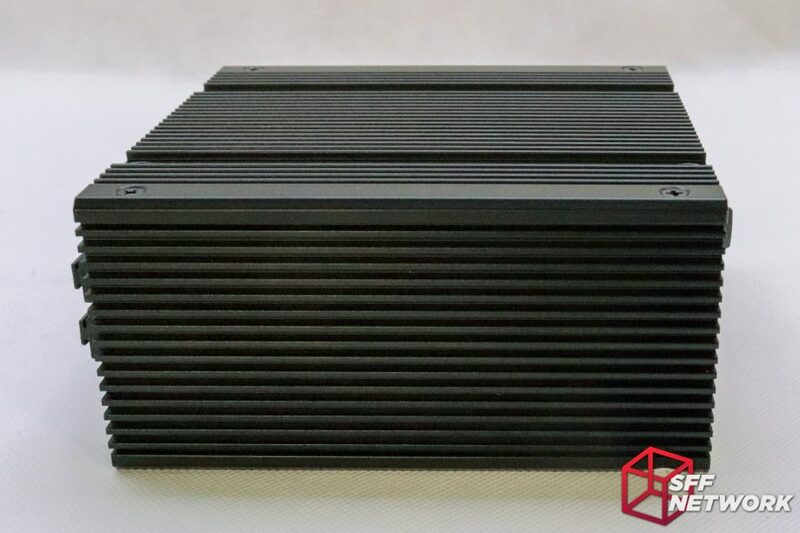 The SilverStone Nightjar NJ450-SXL, as already mentioned, is a step into a new product segment, not only for SilverStone, but for the industry. Whilst various passive power supplies already exist (the rest of the Nightjar family as evidence), none have been in the SFX or SFX-L format. By leveraging their R&D in high power density SFX-L, SilverStone has been able to de-rate technologies they have in the bank, leading to today’s reviewed product. The overall aesthetic is almost as simple as one can get within the realms of needing to form a heatsink from the chassis. 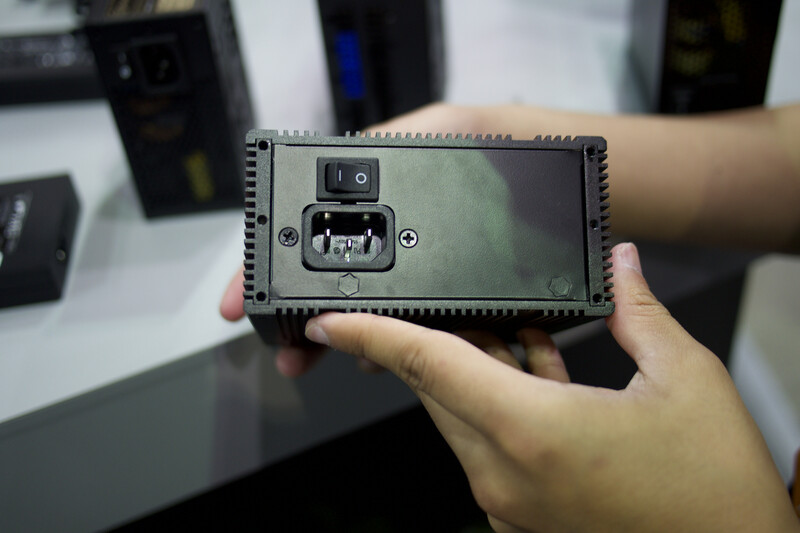 No RGB, grilles, or the like have been bodged into this product, leaving just simplicity. 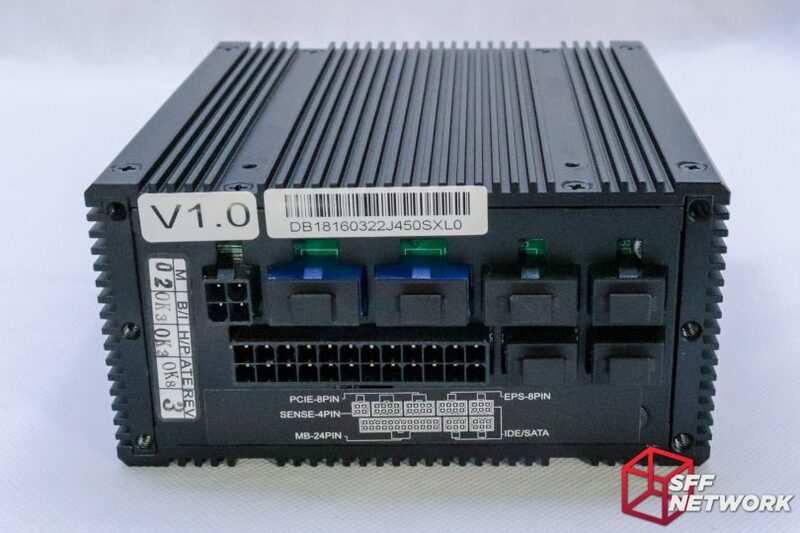 Testing resulted in very impressive performance, with the power supply staying with expected temperatures – even up to full load in a restricted environment. No instabilities were found within the unit’s limits, no noise, coil whine or other electrical gremlins made themselves known. Excellent build quality, great design choices and a good power level means that the Nightjar NJ450-SXL earns a recommendation and an innovation award from SFF Network! That rear sticker is not really that pretty! Price – this is a niche, new generation product though!